Hey guys, let me start off this review by apologizing for our absence (well, mine mostly). I can't blame my cobloggers for not being here haha! I underestimated the workload and stress of senior year that I'm currently sitting here overwhelmed by the amount of stuff I need done by November. So... I'm sorry! The Book's Buzz is a labor of love and something I put my heart and soul into. My intention wasn't to take off for so many weeks without posting, but it just happened. Without further ado, I'm going to direct your attention to my co-blogger Yingchao and her review of the Wolf by Wolf duology. She's been trying to get me to read these books for ages! Hands down, one of the best books [Wolf by Wolf] that I read this year. If you haven't yet read Wolf by Wolf, I understand; please stop whatever you might be doing right now and go read this duology by Ryan Graudin. When you're finished, I promise you that hardly any time in the real world will have passed. I read Wolf by Wolf almost two months ago, and I haven't been able to put to words my thoughts on this book and its sequel. In regards to how quickly I read Wolf by Wolf, let's just say I devoured (no pun intended) this book, at a consistent heart-racing speed. I read it in probably less than 48 hours, even with final papers and projects to turn in for my final days of high school. Now, in regards to my thoughts on this book, which let's be honest, is what this review is really about, I still cannot describe how perfect the story was. 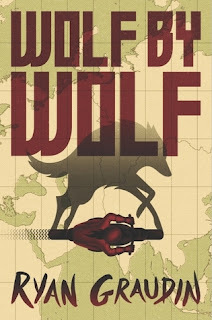 At its very core, Wolf by Wolf is the tale of a mission, carried out by a revolutionary (very classic), using a worldwide motorcycle race as the cover-up (oH yES). It's intense. Our main character, Yael (Ya-El; I believe that's how her name is pronounced), is intensely flawed, and emotionally marred by her past. When you meet Yael, she's quick-witted, and fiercely strong, but as we learn more about this alternate post-WWII world, we learn the hardships that Yael's faced since she was little, and the emotional and physical trauma that she's endured under the villains whom exist in both our world and her world. On top of the high-speed cross-continental motor race that Ryan Graudin executes so effortlessly and flawlessly, there is an additional layer of mystery and intrigue amongst the characters. A mission which seems so simple at sight, becomes so many complicated layers as the race progresses. Yael is challenged to her fullest extents, and we see her become someone whom we might not have at first imagined her to become, but we still root for her. But it takes two to tango, and three to make a crowd. And Yael is not the only character with so much dynamic. Every character that Ryan Graudin introduces into the plot has a purpose, even if they appear just once. Every character is a part of the larger plot, and every character feels real. The story, the world, the characters, the feels. Wolf by Wolf was utterly perfect. Not to mention the obsession with motorcycles that its fostered in me. So of course, upon finishing Wolf by Wolf, I was dying to get my hands on Blood for Blood, and luckily, I had an ARC of it available. While Wolf by Wolf was a crazy, whirlwind of surprises and intensity, Blood for Blood was much calmer, by comparison. Blood for Blood is the revenge story, the novel to bring closure; just like how Crooked Kingdom is for Six of Crows. Comparing Blood for Blood to Wolf by Wolf, I loved Wolf by Wolf far more. For its unexpected twists and heart wrenching moments, Wolf by Wolf will always have a place in my most memorable books of all time. Blood for Blood was a more thought-out journey from point A to point B, where we as the reader generally know what to expect for the most part. Except for that ending. What the f***!?! With that said, I still thoroughly enjoyed Blood for Blood, and though the ending was hard to accept, it does bring closure to Yael's epic tale. I haven't read either but I've met the author and I own both signed books???? I need to read it!!!! Great review!